How he eventually built his log cabin, learned to live off the sea, adjusted to and worked with the hardest taskmaster of all - Nature - fought loneliness and was inevitably drawn to greater understanding of his remote wilderness and its wild creatures, is an inspiring story. His adventures with nesting bald eagles, a cheeky raccoon, grizzlies, a lame seagull, killer whales and other creatures, are as informative as they are enthralling. 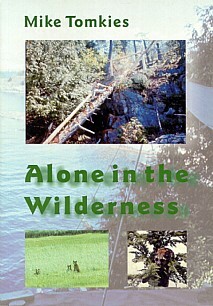 Three extraordinary characters enhanced his experiences: Ed Louette, a skilled backwoods carpenter; Pappy Tihoni, a Scots-Indian who guided him on his most dangerous but fulfilling expedition into the mountains and wild dog Booto, who scratched at his cabin door with wagging tail when loneliness threatened to overwhelm. This book is as compelling and perhaps even more relevant today with the world's great wilderness areas continuing to disappear. We have a selection of Mike's DVDs available such as Eagle Mountain Year. If you would like to receive full details please contact us. A 'must' for fans of nature writing in general and Mike Tomkies in particular.